Chalkboard bumpdates. I think this is the definition of ain’t nobody got time for that. Pretty much every other aspect of working/blogging is doable for me except making chalkboards, as there are four tiny hands that just love to erase whatever I have made or add their own artwork to it. Not to mention, time. is. flying. I cannot believe next month is already the end of my pregnancy! I’m not even going to lie, I have really enjoyed being pregnant this time & will miss my baby bump tremendously. Maternity clothes: Wearing one of my favorite dresses EVER, this Isabella Oliver halter dress is soooo comfortable, I have been wearing it non stop! I love the color & it leaves plenty of room for my belly to grow over the next two months! I have almost fully given up on regular clothes & have really been embracing maternity style this pregnancy, which I am sure is one of the reasons it has been so much more enjoyable! Sleep: Still sleeping great, minus Eloise continuing to wake up once or twice a night. Will it ever end? I am convinced she will still be waking up just as often as the newborn come July. Worst moment this month: Aside from the scary car wreck, it has been a pretty great month! Miss anything: I have definitely been pouting about not being able to drink a margarita on Cinco de Mayo or a large pour of wine when the kids are driving me bonkers. But mostly, missing being able to do a lot of stuff with the girls & keep up all day with their endless energy. They’ll both be shocked one day when I can be the one playing airplane or giving them horsey rides around the house again! Cravings: Watermelon, fish tacos, & chocolate chip frozen eggo waffles. And yes, I would definitely eat them all together. Queasy or sick: Feeling good, minus some super excessive heartburn. Bleh! Looking forward to: Summer! We have so many fun things planned & I can’t wait to do them all as a new family of FIVE. (also picking a name, because we haven’t even come close to doing that yet.) We can’t wait to meet you baby girl!!! Love it! Pregnancy looks so good on you. Your hair looks incredible and so does your skin!! You look amazing! I was so uncomfortable the last half of my pregnancy and this post makes me wonder if I should have invested in maternity clothing. I just never saw anything cute.. not even close when I was out shopping, but you keep on posting cute maternity stuff so I'll have to look harder next time around. Also, my 16 month old just finally stopped waking up every single night. We're talking like 5 times a night. Our ped said once kids turn 1 a switch just goes off on rough sleepers. So hopefully Eloise will start sleeping all night long for you SOON! A friend of mine has 2 little ones sharing a room about the same ages of your girls and she puts extra pacis for her 1 year old on her 3 year old's nightstand to give to the 1 year old if they wake up. Maybe harper could help out! My 20 month old is still waking up at least 1x a night and I'm now pregnant with my second. My two will be 27 months apart, so I love following your blog and getting an idea of what's to come! I just love reading your updates! I have been following you since you were pregnant with Harper and I'm always so excited to see you post. Can't wait to see pics of baby girl #3! We wear pregnancy so well! Can't believe how quickly time is flying!!! You look great! Can't believe you're almost at the end, how exciting! You are just gorgeous. I love that dress and the color!! You just look flawless! I can't believe how fast 7 months has flown by. So excited for you and your family. Many blessings. I hope you have a fantastic mother's day! 7 months?! Woah. This pregnancy has flown by! Though I'm sure you'd disagree (; You're still looking great little mama! Hope you have a wonderful weekend with the fam!! Hello from Spain: I like your pregnancy looks and you are very pretty. I like yoyr blog because I am a mother too. At this point I am very interested these reflections so I created a blog dedicated young people and their use of new technologies. I invite you to visit: http://cativodixital.blogspot.com.es/ If you want we kept in touch. I already made me a follower of your blog. Your outfits look great! I wish I would have been taking photos. I'm due the first week of August and I haven't really taken many photos. It's not to late to start though right? Oh how I love those two with their suckers! 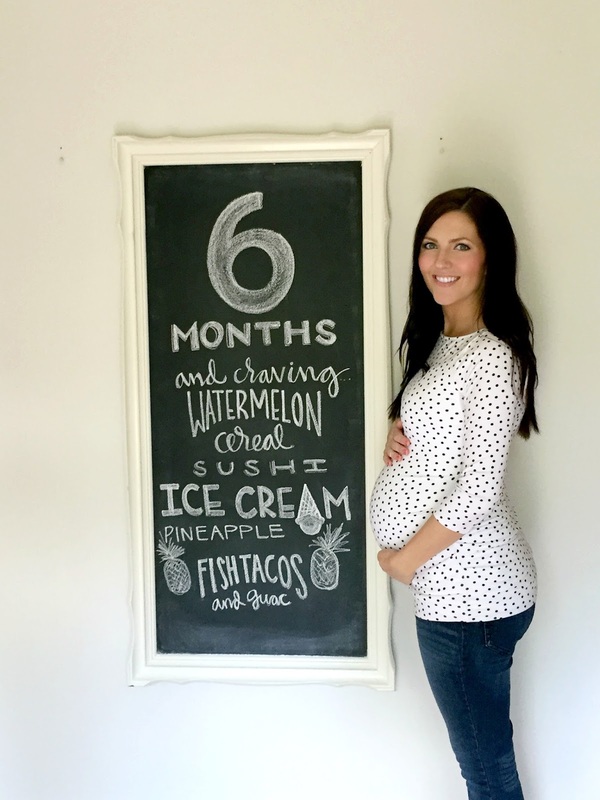 Glad to see the chalkboards make it on the blog this pregnancy, even if you're scrambling to do it! I can't believe you're 7 months already!! This pregnancy is flying by! 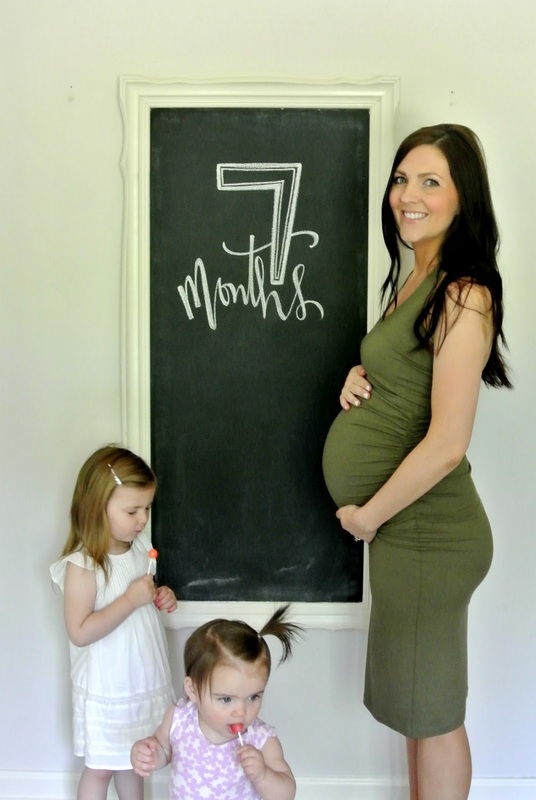 and you my friend are seriously the poster child for pregnancy… so beautiful. After reading this I'm feeling like my 6 month old waking up 3 times a night isn't normal! I make sure her little tummy is full and everything, but no luck! Any advice? Eloise's pony tail is just the cutest! I can't believe you are 7 months already!! could you be ANY cuter mama???? i swear i think not!!! we HAVE to do a Sugar Bit feature with all three girls in some summertime goodies!!! Looking fabulous, Momma! That dress looks gorgeous with your dark hair! And speaking of hair, sweet little Eloise's hair looks exactly like my Olivia's – same deep right part with a little widow's peak in the front… I can't not put a rubber band or bow in it because her hair goes straight in her eyes if I don't! you look great! just wondering if you could do a post of what is in your hospital bag? Ha that first picture is perfect! And you look fantastic!! Both of our daughters' names were the only two girl names we liked, so if we ever had a third girl, we would be screwed! My 13 month old still wakes up 2-3 times a night. I have no idea how to put a stop to it. I'm afraid if I let her CIO, she'll wake up her big sister and then we'll have both kids up. What do you do with Eloise when she wakes up? I give my girl a bit of milk and rock her and put her back down. I'm usually up with her for about 15mins at a time. You look stunning!! And the little ladies add such character to the picture! I love your bump updates and I am so upset that I didn't see this yesterday! If you need some name help, I think you should give her a name that has six letters because Harper & Eloise both have six letters. Also, try the baby name genie. It's amazing and so very helpful. Love your blog and your girls!! MAN you make pregnancy look adorable! Looking GREAT girl! Congratulations Mama, you look amazing!! We are about to have our second baby girl and you are my reassurance that it can totally be done. I am a little nervous about all the things that come along with having 2 kids!! I can't believe you are about to have 3..seriously you're amazing! I sort of dropped off blogging land for a whilte but if you haven't done a post about balancing your kids schedules etc I would love to read one!! You are so beyond adorable! I hope I am that cute and positive when I'm pregnant! Our thoughts are with you mama! Wishing you energy to get through the next few months and patience to enjoy every moment without thinking about the next! Oooh! I love Blaire, Greer and Wren!